Oakland’s Department of Transportation is planning a round of inexpensive and quick-to-install safety fixes around the Lake Merritt BART station. “We want to improve five intersections,” explained Nicole Ferrara, Vision Zero manager for Oakland, during an infrastructure improvement tour Wednesday afternoon. The intersections are Jackson at 8th, Madison at 7th, 8th, and 9th, and Oak at 8th. “They are where we see the biggest problems,” she added. Anyone who uses the Lake Merritt BART station has probably noticed upgrades going on with the traffic signals; the city is installing arms to hold signals directly over the lanes, which improves compliance, explained Teresa Peterson, also with Oakland’s DOT. They will be adding leading pedestrian intervals to the signals. And they have upgraded curb ramps. All of this is in response to past fatal and injury crashes around the station. The signal improvements are being funded by a Highway Safety Improvement Program (HSIP) grant, explained Ferrara and Peterson. This signal project started planning years ago, before the creation of Oakland’s DOT. Its director, Ryan Russo, now going into his second year at the helm, asked Oakland staff to look for ways to further improve pedestrian and bicycle infrastructure around the traffic lights and intersections. “We saw an opportunity to narrow all the approaches to the intersections,” said Peterson. “There are already bike lanes, so we’re able to pull the bike lanes in to do these protected intersection treatments.” The plans also have buses stopping in the “shadow” of the painted bulb-outs (see the bus in the upper-right corner of the lead image). A detail of the plan for Madison and 8th from an OakDOT schematic. The intersections will get paint and bollard treatments, similar to what San Francisco does, but Oakland will use larger K71 bollards instead of safe-hit posts (see the last photo). Ferrara reports that the K71’s seem to hold up better. Two of the five intersections will get bicycle protection. There won’t, however, be protected bike lanes. The data, explained Ferrara, shows that the intersections are where most serious injuries and fatalities occur, so it makes sense to tackle them first and visit the question of parking-protected bike lanes later. They are also varying the paint color. “Just because it’s for safety doesn’t mean it has to be boring,” she said. In the case of the BART station, because it is the station for Chinatown, they decided to go with maroon, since gold and maroon are Oakland Chinatown’s thematic colors. The project has hit a small setback, however. To save time, the city wanted to hire the same contractors doing the already-in-progress-and-nearly-complete traffic signal and curb-ramp upgrades. But the contractors on site wanted to charge $500,000 to do the extra work on the five intersections, rather than the $200,000 the city estimates it should cost. Oakland staff is now looking at how to get it done separately. How long will all this take? The traffic signal upgrades are basically finished, but the timeframe for the additional pedestrian and bike improvements isn’t yet established. Ferrara explained they will follow the quick-fix strategy they used at the intersection at 23rd and Harrison. As previously reported, that crosswalk upgrade was installed in August of 2017 after a pedestrian was killed that June. According to DOT spokesman Sean Maher, the city estimated that the upgrades cost about $30,000. They included a trapezoidal crosswalk and extending out the pedestrian refuge area to give added protection and prevent motorists from making left turns across the pedestrian space. They also narrowed Harrison from three lanes in each direction to two, which reduced “egregious speeding” without reducing overall traffic throughput. If the Lake Merritt BART area upgrades use the same materials and strategy, they should be installed in a couple of months. Meanwhile, Ferrara reports that motor vehicles now yield to pedestrians at 23rd and Harrison 96 percent of the time, where previously the yield rate was ten percent (which compares quite favorably to signalized crossing treatments, such as HAWK lights, by the way). Further planned upgrades will improve the crossing with concrete. This looks like a great start and should be replicated in many other intersections as well, but why is it still $200,000 and why isn’t this work the city can do? Also, we should really look to adding more protection for pedestrians because images like the leading photo make it look easy for a car to follow the bike lane through the painted area and easily make a right turn. AND when intersections like these finally DO get built out, we need to remember to add pedestrian scale features like lighting and landscaping because I’ve seen far too many concrete deserts . That is not a red light camera, it is a traffic detector. Simply lets the signal know if theres a car or bike waiting for green. The worker installing the thing told me it was a red light camera. But I think you’re right. I’ll take it out and double check. Thanks for pointing it out. Dream on. If anything, these gigantic signal masts and the beg buttons have taken a little slice out of the already stingy pedestrian realm. PS: Heard back from OakDOT. You’re absolutely right. Thanks for flagging it. Good point, but the research itself says two to five meters, so ~10 feet is tolerable. It’s not clear if they have that much space, but since this is also based on paint and bollards, there is more room for leeway since it’s easier to change them. The quick-fix install referenced in the article on Harrison at 23rd was done in-house by Oakland public works crews, and was designed and completed in just two months. The speed and design was impressive, but the quality of the installation was a bit more sloppy than what I’ve seen from most contractors. The existing Lake Merritt BART installations were funded by a federal grant, including a lot of project elements that public works employees don’t have the equipment or training to complete. I think the hope was to tack the striping work on to the existing contract to save money, but if that’s not possible it’s likely that it will end up being done by city crews. For Oakland, and moreso for even smaller cities, it can be difficult to do work in-house due to a lack of trained staff, and equipment. It takes a certain critical mass of projects to justify the purchasing and training, and Oakland is just now hitting some of those marks thanks especially to a local transportation funding infusion. The design for the bike lane makes no sense. Why have the bike lane swerve to the right at the intersection and then back to the left? If they’re thinking they’ll flip the on street parking and bike lane creating a protected lane with a buffer to prevent dooring. Yes, those traffic light and mast builders are making a fortune on American cities. Why not put much smaller masts (and traffic lights) on the near side of the intersection? 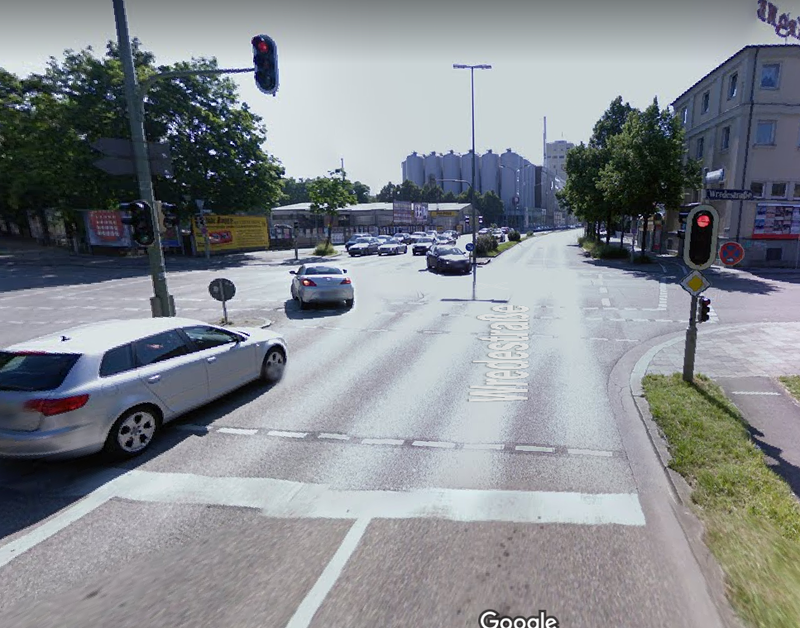 This has the additional benefit of keeping stopped cars out of the intersection, because if they stop too far forward, they can’t see when the light turns green.